Released in October, 2014, ‘Alien: Isolation’ is arguably the best ‘Alien’ video game ever made. While not everyone warmed to the idea of what I like to call ‘Alien: Hide Under the Desk Simulator, 2015’, this game was the shot in the arm the series desperately needed. There was no Official Collector’s Edition released of the game; but collectible items of various forms were released. Certainly, there was no maquette or statue or action figure to accompany the game upon its release. 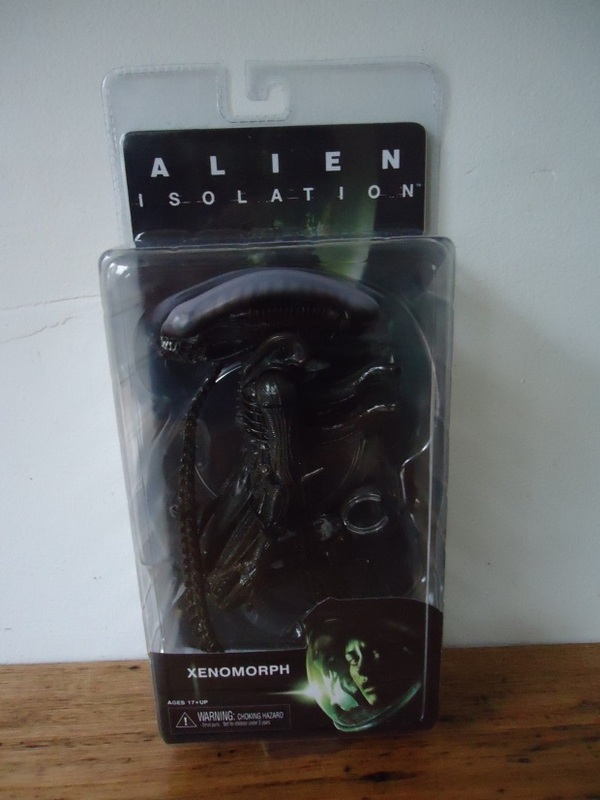 NECA did answer the call – albeit a little late to the party – and provided fans with a trio of ‘Alien: Isolation’ game-based action figures in December 2015. 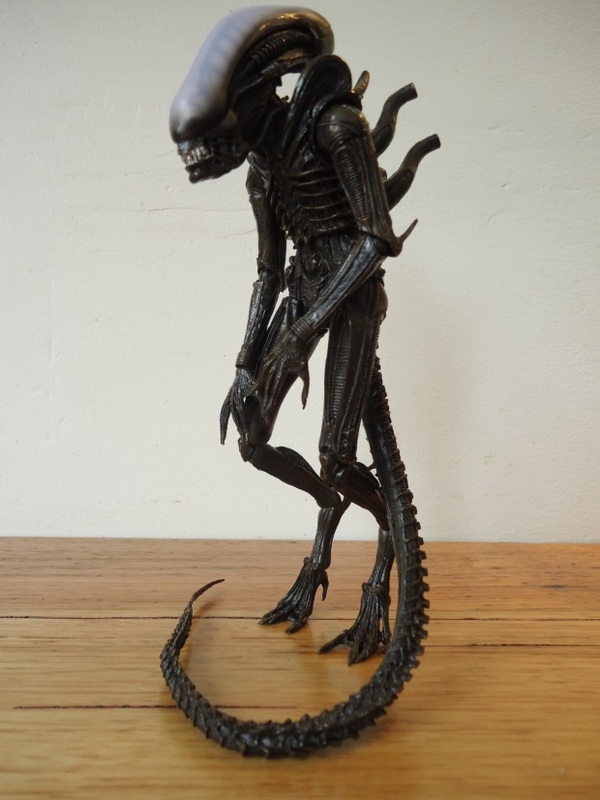 NECA’s ‘Alien’ Series 6 consisted of 2 versions of Amanda Ripley along with a version of the Creature itself. This set of figures arrived on store shelves just before Christmas 2015. More than a year after the game’s release date. This review will be looking at the Creature, ‘Alien: Isolation’s’ Xenomorph; or as fans have lovingly embraced his very appropriate moniker, ‘Stompy’. A title he has earned due the characteristic heavy footfalls that always announce his presence whenever he is near, seeking out the player to rip their face off. 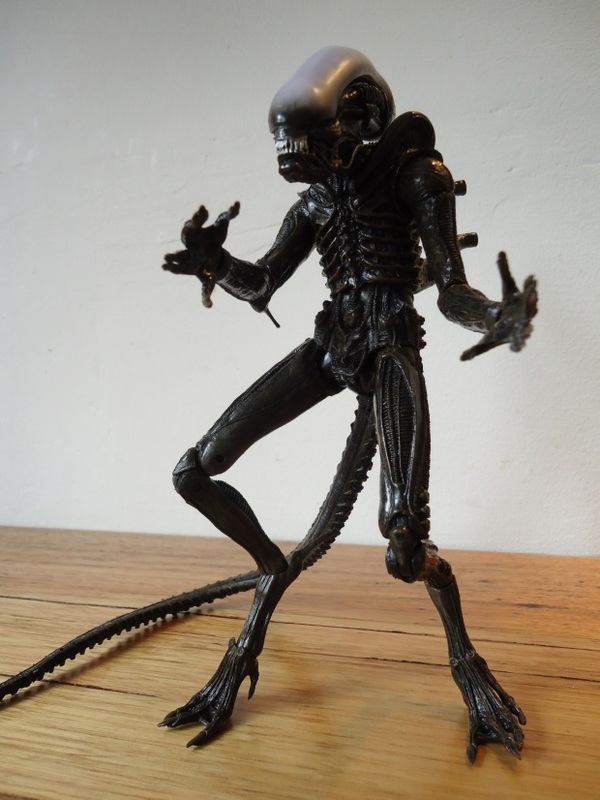 The good news is Stompy has now become a fabulous fully articulated action figure in NECA’s well established 7 inch range. 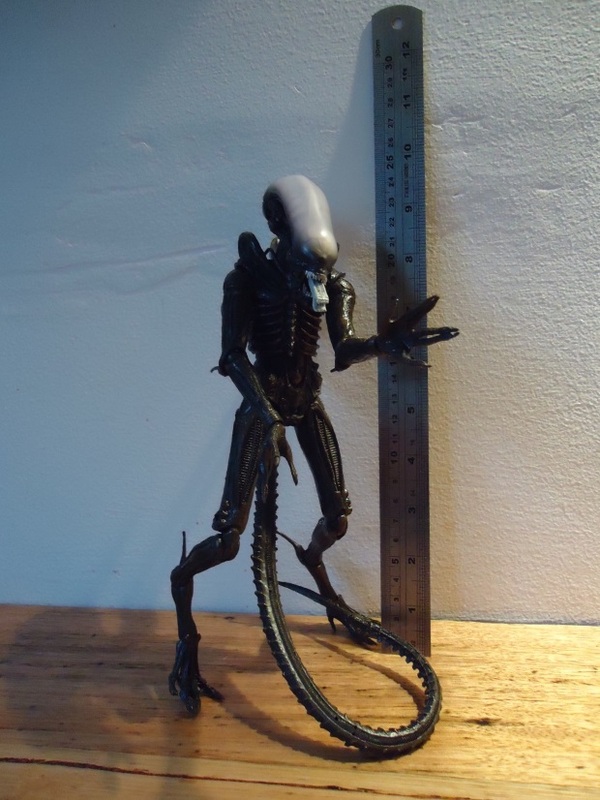 Due to the nature of the figure’s digitigrade legs, that height can be extended to easily exceed well beyond a full 9 inches when he is standing fully upright; or he can be crouched right down upon his haunches if so desired. The range of articulation throughout the figure is impressive and allows for great opportunities to stand it in an excellent range of poses. 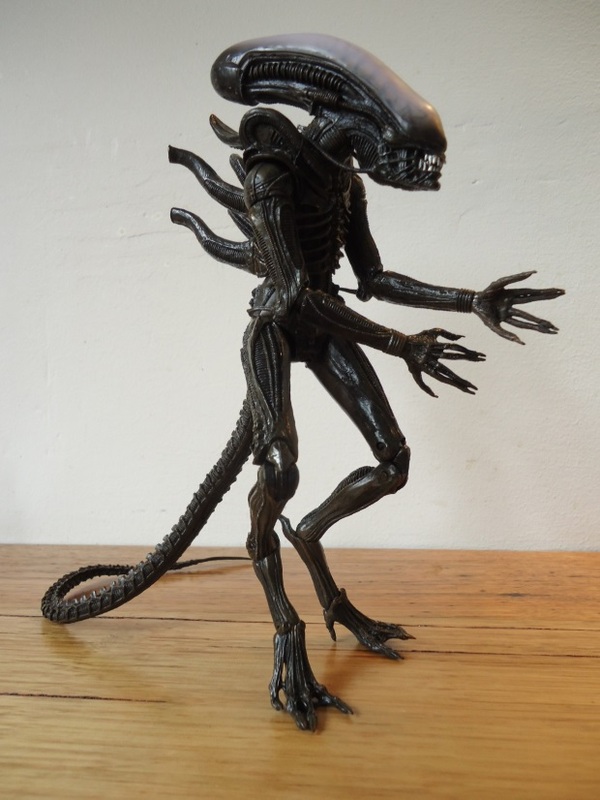 Multiple joints throughout the figure serve it well and while it’s essentially a reconfigured sculpt of NECA’s earlier Series 2 Alien, it possesses enough features to set its identity apart. It’s actually amazing how little changes have made this iteration differentiate it from the earlier version. The head, torso and arms will be familiar to owners of that earlier figure but substantial amendments to the legs and tail have been made to associate the figure with the creature that appears in the game. Considering that the game character shared so many characteristics with its filmic predecessor, I’m totally OK with the way the older sculpt has been retooled for the newer figure. Let’s take a look at the major changes that differentiate this particular specimen of Internecivus raptus from its earlier incarnation. Amongst the necessary changes are the tail, which is now longer and instead of terminating in a cruel barb it now ends in a long blade, which would often impale less vigilant players in the back if they were careless. I know that tail all too well and it is represented excellently here on the action figure. Articulation in the tail is well served by a flexible wire core that runs almost the full length of the prehensile limb and permits the tail to be bent in many different curved positions. The wire core doesn’t run the full length of the tail and I’ve seen some people report that the wire may puncture to the tail’s surface. Fortunately, I don’t have that problem with this figure. 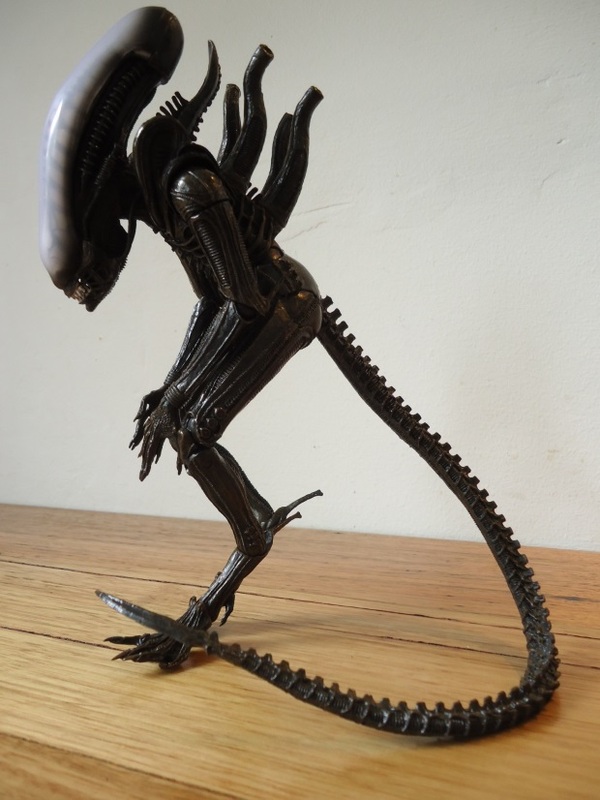 The legs are another major feature of the game based Creature that have translated well to the action figure format. Here the long, digitigrade limbs are very identifiable and recognisably associated with the game character, including the presence of the dewclaw. It’s a great remodelling of the legs. The articulation here includes ball joints, double Knee joints and hinges. These all work in tandem to stand the figure up and hold it various poses. These are aided by the long tail so that these 3 points of contact on the ground are always being used to aid in stability when free standing the figure. The only drawback with the digitigrade arrangement is the lowest joint on the leg at the ankle may weaken over time. In terms of other articulation throughout the figure, there are points of movement at the shoulders, elbows and wrists. Each joint possesses a combination of ball and socket, hinges and/or spindles. All used to good effect. The neck and the abdomen each have ball joints that allow moderate amounts of movement which are all welcome. The toes are also blessed with a hinge joint to aid in a variety of poses. The detailing throughout the figure is exemplary. The head has a frosted carapace rather than the grey tinted variety the game character possesses and a hinged mouth that allows the tongue to slide and move forward manually. The entire body sculpt is excellent and the limbs are fabulous. 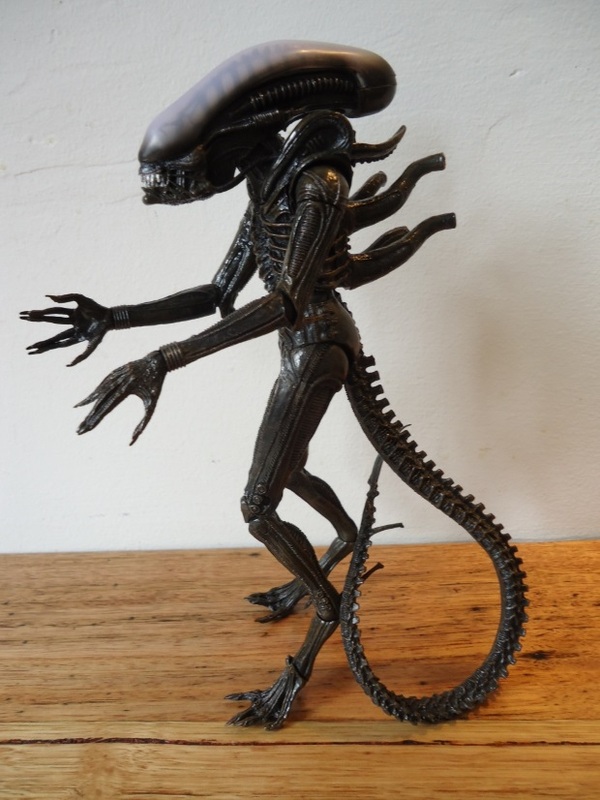 This is not surprising as these features are carried over from the earlier Series 2 Alien figure, which itself was a terrific sculpt. 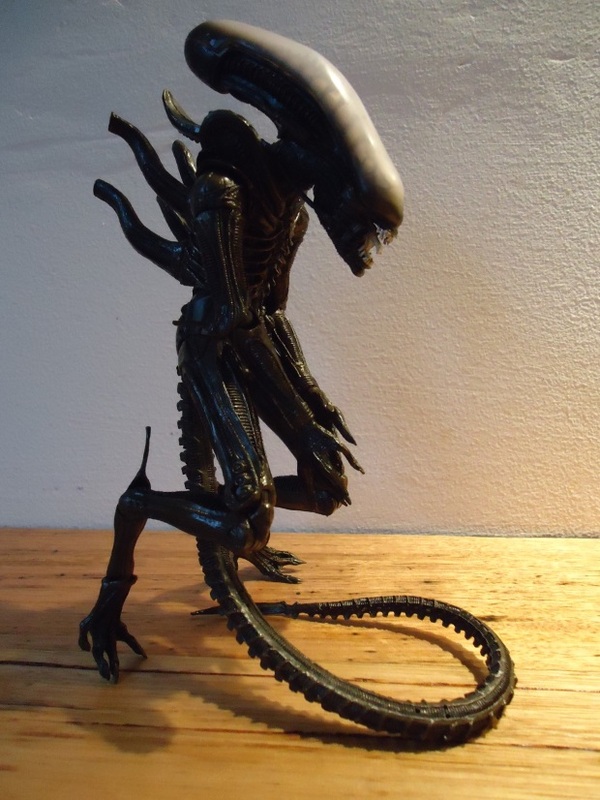 A thin, brown wash covers the figure to give it a murky, wet and slimy appearance and is the figure’s major paint application which serves it well. The frosted carapace on the head and silvered dentition and tongue complete the figure’s gruesome and otherworldly appearance. It’s just a small disappointment on my part that some anomalies do exist on the figure. While these small deviations will appear to be nitpicks, they are nonetheless present. As the head is the same tooling as the earlier figure, this figure possesses lips. In the game, Stompy completely lacks any fleshy material that closes his mouth. It’s no big deal – lips on the video game character model would have been great and their absence on the character has been noted more than once by fans. Also of a minor concern (unless you are me) is how each of the hoses from the radius of the jaw extend backwards over the shoulder and drop down to connect to the figure’s scapulas. Whereas this may be the correct configuration with the original movie version, The ingame character model for the game actually has the hoses connected differently. Those flexible hoses should reach upward at the shoulder and connect to the head. With this figure they fail to do so for their presence to be accurate. I’m sure it would have taken NECA minimal additional effort to attach these hoses correctly. The only other minor quibble on my part is the number of segments to be found on the tail (Yes! I am that picky! Don’t worry, I know others who are even worse than me!) Whereas the creature in the game has 40 tail segments, the tail on the figure possesses 54. It’s no big deal and it works on the figure. The tail may even be shorter than how it appears in the game. 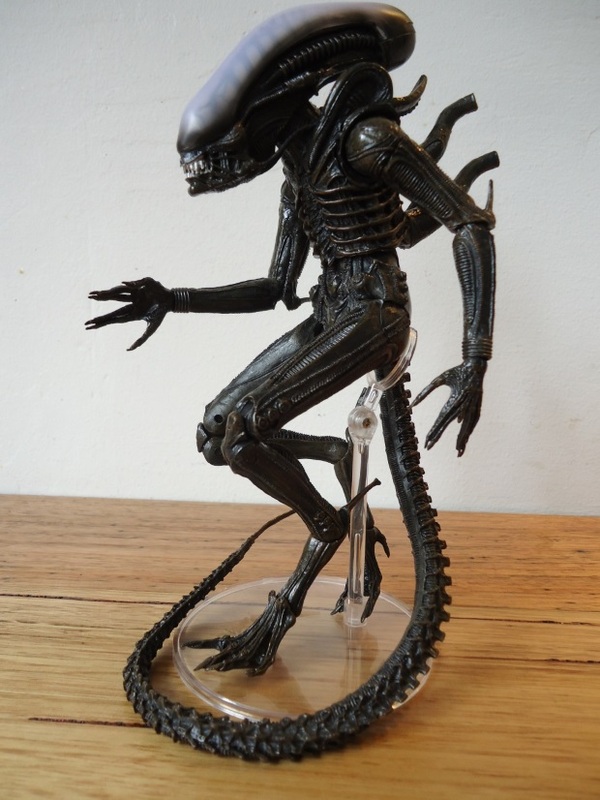 Notwithstanding these minor anomalies, which by no means detract from the excellent figure, this is a superb rendition of the in game character and for those of you who just need more Stompy in your life, then this figure would be a great addition to your collection. A display stand is included with the figure and it’s a basic clear mast mounted on a base with a C-clip attached via a hinge. You can either fasten it to the figure’s leg or tail in order to use it to help stand the figure in poses that might require the tail to be free and elevated off of the ground. 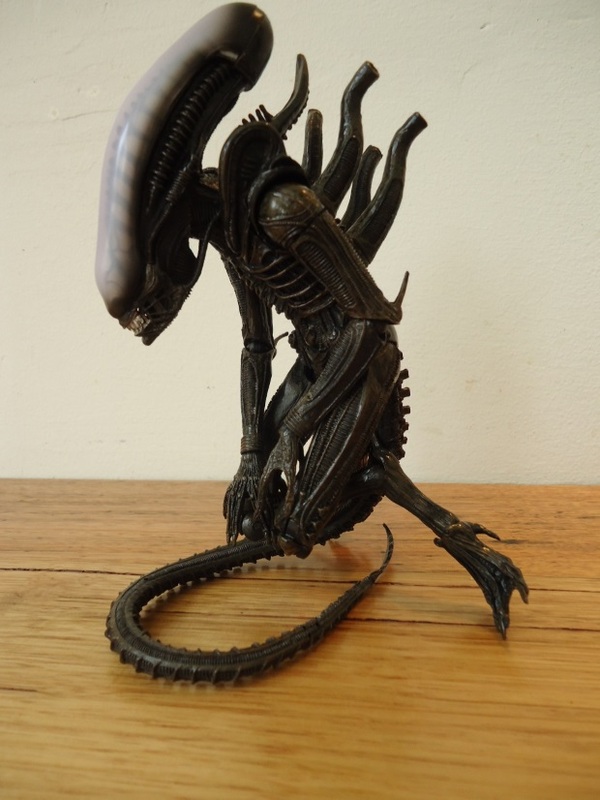 It’s a nice inclusion and it is exactly the same display stand previously released with NECA’s earlier Series 3 ‘Dog Alien’ figure. While it’s a welcome addition to the excellent package, the display stand is a little short. It could easily have benefited from being another inch or 2 taller. Being able to grasp the figure around it’s abdomen would have been ideal, but you’ll have to settle for using it to grasp a thigh or the tail. A great figure! Well detailed and thoroughly articulated throughout. For added authenticity, prop him up on your desk while you hide underneath of it, quivering and babbling in abject terror as Stompy makes your desktop his domain. I bought one. The left arm broke off at the elbow after five minutes of moving it into different poses. The left ankle joint also became extremely loose after moving it into different poses. When the figure’s mouth is fully opened their is a very noticeable gap between the side of the cheek and the top of the cheek. It doesn’t extend far enough into the side inside of the head so it leaves a gap. But this figure is meant to be viewed in a dark environment so it doesn’t stand out unless there is too much light. I still like this figure a lot though. I used a glue gun to reattach the arm. I’m planning on carefully prying off the carapace and painting over the black ‘veins’ or ‘cracks’ on the forehead because I think they look dumb. Then I’ll reglue the carapace back on. I like the dark ridges running up the length of the beast’s head under the carapace, so I won’t paint over those. The ball joints on the elbows are always visible no matter what position the arms are bent at. Either from the front or rear. Sometimes both. The actual arm parts could’ve been made to cover them a little better. The knee joints are way too visible too. I find this annoying but both of these complaints don’t don’t matter in a dim lit room. You can’t tell as much in lower lighting. I agree the jaw hoses should have connected to the head but this really doesn’t take anything away from the overall aesthetic like the exposed joints do. For me at least. Nitpicking here. That looks like one cool figure. Nice review! Awesome review. Very detailed and precise. Exactly what we need. I wish you did YouTube video reviews. That’d be awesome.